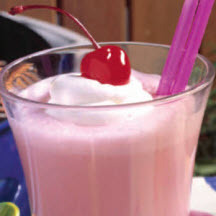 Cherries add colorful cheer to holiday eggnog! Drain cherries, reserving juice; set aside. Mix eggs, sugar and salt in heavy 2-quart saucepan. Stir in milk. Cook over medium heat for 10 to 15 minutes, stirring often, or until heated through. Remove from heat. Stir in reserved cherry juice and vanilla. Just before serving, stir in half-and-half and rum. Sprinkle with nutmeg. Serve immediately. Garnish each serving with a stemmed cherry. Nutrition Information Per Serving (1/12 of recipe): Calories: 173; Fat: 5 g; Saturated Fat: 3 g; Cholesterol: 64 mg; Sodium: 94 mg; Carbohydrates: 23 g; Protein: 4 g; Fiber: .3 g.